NDC Technologies introduces the PrediktIR gauge for the on-line moisture measurement of bulk materials during processing. The PrediktIR gauge meets the true demands of bulk processors looking for a basic on-line moisture measurement solution that is stable and accurate. 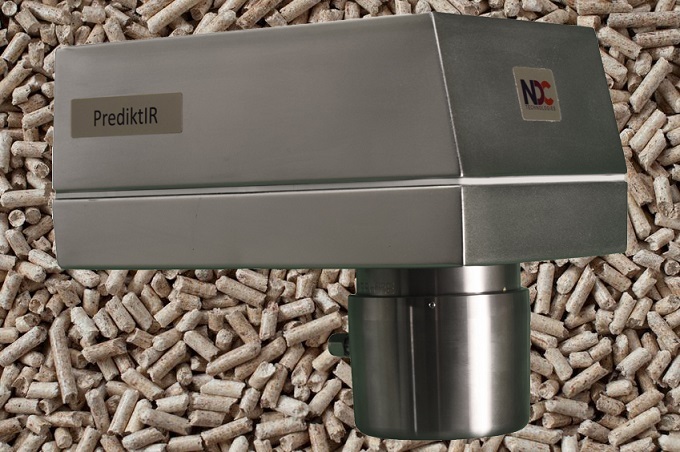 Based on NDC’s proven optical filter technology, PrediktIR delivers continuous moisture content information of bulk materials in real time, enabling the automatic and tight control of drying processes without having to wait for lab sample results. PrediktIR offers long-term instrument stability and basic, yet accurate, moisture measurements independent of changes in ambient conditions such as lighting, temperature, or humidity. This moisture gauge also provides tolerance to physical process changes such as pass height. PrediktIR is available in two configurations: Single gauge with Operator Interface (OI) and dual gauge with both instruments connected into a single OI. Applications include single-point measurements, i.e. after a dryer or conditioner. Dual-gauge applications enable the user to take measurements before and after a drying or conditioning process to closely monitor moisture content. PrediktIR can be easily installed in most processes, including above a conveyor belt or where product is transported in enclosed ducts using NDC’s proprietary PowderVision probe. PrediktIR can also be equipped with an air purge window to keep optics free of dust and other volatile contaminants.